This name is bad to the bone stick, which is just a nub trigger anyway. Everything about this product, including the bar itself, is trying to be what it is not. The carton graphics are way too busy and look an awful lot like doveicecream.com. There’s no hierarchy of messaging. Wonder how much was added to the cost of the box to get those rounded edges. They mimic the smooth, rounded shape of the bars themselves, but these curves really amount to less bar for your buck…snuggly tucked in a gold-colored foil-like wrapper. Yeah, I was really getting’ my hopes up of finding a gold-plated chain or ring inside — a la Cracker Jacks. The fun didn’t stop there, because the wrapper informs you that this “unit” is not to be sold individually. The box front illustration is “enlarged” to show detail. An ad states the product is “for pleasure seekers.” No, this is escapist food, aka nutritional therapy. They should have kept the flavor naming consistent, too. Unless they plan to have both regular and double varieties of caramel and chocolate, there is no need to write “double.” In fact, it makes me think that the classic and almond versions have less whatever (and they might), but then why not keep the products consistent within the same space. From the brand’s Twitter bio: it inspires a “stylish and luxurious lifestyle.” Magnum bars are Magnumb and numb-er. 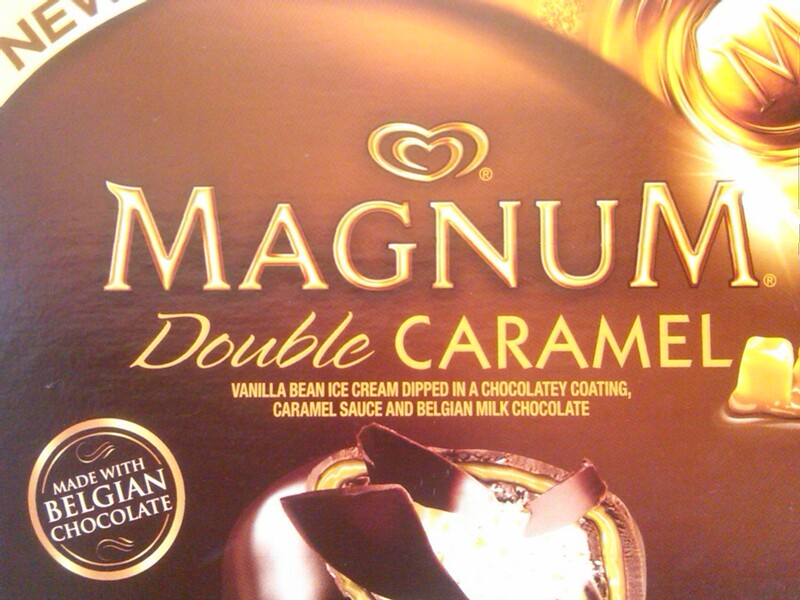 Next time you ask someone to pick up a Magnum, be sure you specify it’s ice cream you want. Unless, of course, you’re got other ideas: 1.5 liters of your favorite bubbly, condoms and/or with re-runs of Tom Selleck as backdrop to go with that gun. Picture this: Both hands on a Magnum. The good news for the brand manager is that it seems they are appealing to their target but at the expense of putting off others. I’m finna eat my Dove just because it is less pretentious.